FOOTPRINTS left by ancient humans 800,000 years ago have been found in Britain, the earliest evidence of such markings outside Africa, scientists say. 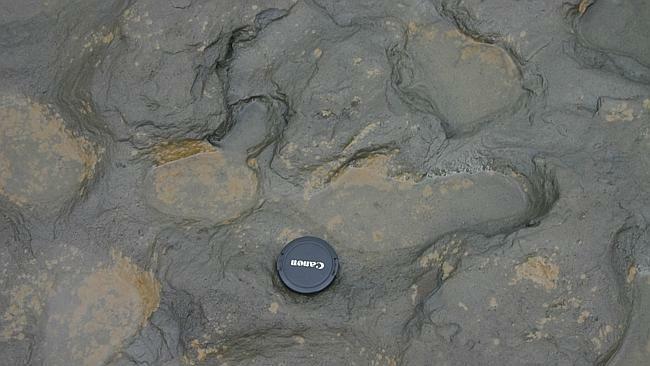 Researchers discovered the footprints, which were left by both adults and children, in ancient estuary mud at Happisburgh in Norfolk, eastern England. The only older footprints found so far are at Laetoli in Tanzania, at about 3.5 million years old, and at Ileret and Koobi Fora in Kenya at about 1.5 million years, they added. “This is an extraordinarily rare discovery,” said Nick Ashton of the British Museum, who led the research team, which also involved the National History Museum and Queen Mary University London. The discovery came at an archaeological site that has yielded several previous discoveries of stone tools and fossil bones, including mammoth remains. The researchers found the prints at low tide when waves washed away much of the beach sand to expose the silt below. “At first we weren’t sure what we were seeing but as we removed any remaining beach sand and sponged off the seawater, it was clear that the hollows resembled prints, perhaps human footprints, and that we needed to record the surface as quickly as possible before the sea eroded it away,” Ashton said. The group of early humans that left the footprints appeared to have consisted of at least one male and several smaller people believed to be females and youngsters, the researchers said. “They are clearly a family group rather than a hunting party,” said Ashton. The footprints were dated at 800,000 years old partly on the basis of the site’s geological position beneath glacial deposits, but also because the fossils there come from now-extinct types of mammoth and horse and early forms of vole that were alive at that time. A team from the British Museum, the Natural History Museum and the University of London uncovered imprints from up to five individuals in ancient estuary mud at Happisburgh on the country’s east coast. The scientists say the humans who left the footprints may have been related to Homo antecessor, or “pioneer man,” whose fossilised remains have been found in Spain and who died out 800,000 years ago.